In the past, fire has played a pivotal role in people's life. When the television arrived, the center of many homes became the screen. 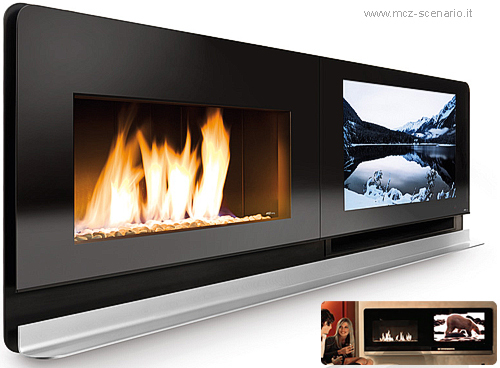 Since then, fireplace becomes more a fashionable or an emotional experience than a functional need. Scenario Fire combines both concepts into one single product in a way that none of them would loose their performance and meaning. The result is a front cladding made of tempered glass integrating a closed fireplace Vivo 90 Wood and a Loewe 37’’LCD TV with two 60W speakers. Materials: 4 mm. ceramic tempered glass, painted steel. Dimensions: 2050 x 750 x 100 mm.